What makes this beer different: The highest rated hefe on BeerAdvocate. Deservingly so. Will I be drinking this again: Yup, this just bumped franzy as my favorite hefe. 11/1/2010: Most difficult beer name to pronounce ever. “Why-hine-steph-ahner”.. Does that sound about right? I was trying to tell my buddy about this beer, and had no clue how to say it. Also, why aren’t there pint sized weizen glasses out there? Maybe there are but I have not seen any. There is always so much empty space in the top with these .5L glasses.. The nose is a ton of banana. I know Weihenstephan has their own yeast strain, and it shows as all of their beers seem to have this amazing banana thing going on. The flavor is just about perfect as far as a hefe goes; banana, yeasty, some clove and a hint of lemon. Really don’t know how to describe the mouthfeel other than great. Rich, creamy, and very well carbonated. Would love to get a fresh case of this when summer rolls around. Picture of the day: This one is a must click. Top 55 posters from the rally to restore sanity and/or fear. Will I be drinking this again: Oh yes, have had many in the past and will have many in the future. 2/14/2010: So I know its Valentine’s Day and I am supposed to be drinking “Two Hearted Ale” or something red, but this beer has been a favorite of mine for years. So why not drink it today? I have a Two Hearted sitting around but I am letting it age a bit. So I am assuming most people reading this have had a Franzy as it is fairly popular, but if you haven’t you need to try it. My roommate buys about a case per month he loves it so much. Smell and taste are full of lemon and clove, with a tiny banana kick in the background. Overall its a bit sweeter than your typical hefe. Mouthfeel is also a bit thicker than most hefe’s. It is dangerously drinkable. Without a doubt one of my all time favorite session beers. Also a great gateway beer to introduce to that friend of yours that only drinks Miller Lite. Funny Picture of the day: Oh man is this not the truth. Can women talk or what?. Will I be drinking this again:Not sure how hard it is to find but if I can then YES. 1/12/2010: Yet another A- or better, well don’t worry because the one coming up tomorrow was very ‘meh.’ This is my first hefeweizen so far, hard to believe because its one of my favorite styles. I think its because during the winter I tend to lean towards drinking heavy beers to add to my natural winter coat. The born on date of this beer was 03/08, which I failed to see before I bought it. As I expected when I opened it I noticed a pretty funky skunky sour smell, but surprisingly the taste wasn’t stale at all. This had a very nice sweet malty taste for a wheat beer, with come clove and a little banana thrown in, also a bit tart. As you can see the color is darker than your normal hefe, and the mouthfeel was a bit heavier as well. Very nice refreshing beer, I would like to have tried this one a bit fresher but was still very good. Going to try something new. I will be adding a link to a funny picture at the bottom of all of my reviews, why? Because laughing is good medicine damnit that’s why. 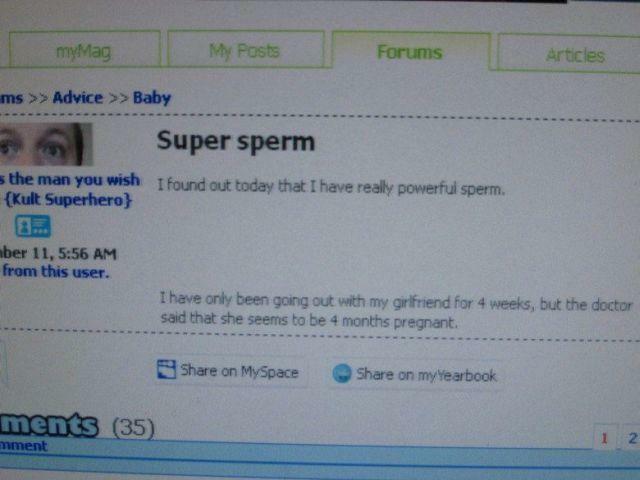 Funny Picture of the day: Apparently this guy has time traveling sperm.